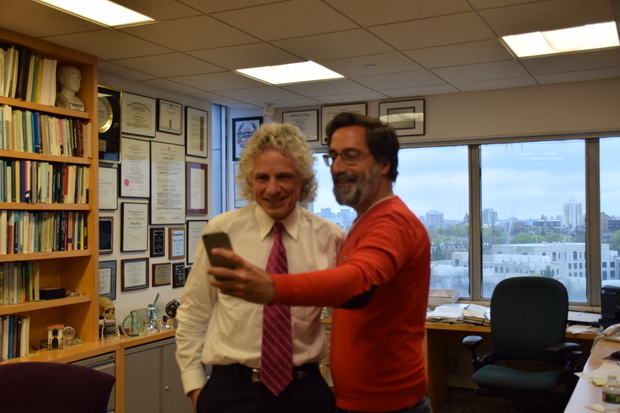 Mr Pinker, you focus your work on cognition and language. In regards to politics, peace and negotiation in a digital age, how do cultural differences affect the way countries work amongst each other? There are no obvious ways in which cultural differences have affected international negotiations. Everybody in the international arena is in a position where cultural stereotypes are not included in negotiations. I don’t want to rule out that there are cultural differences and norms across international parties, but they are not obvious. You say we have more types of violence these days, whilst scientific research claims there is less. Is this due to our brutally violent history? What, or who, is responsible for the decrease? Of course there are factors such as globalization – countries are more enmeshed, so their welfare is directly impacted by the welfare of another state. The incentives for conquest and invasion have been outnumbered by the incentives to make business – what that means is that a person alive is worth to me more than a dead one, or buying a good is easier than stealing one. Another factor is the change in value systems. Wars were fought over religion, over nationalism, over what script systems to use. Now, each country has their own land and their own language. Also, there has been a global trend toward humanism, where the ultimate goal is achieving health for women and children. When I say global though, it does not mean that it has taken over the entire planet. Since we are tribal creatures, there is always a temptation to backslide. Comparing the two halves of the twentieth century though shows you that there is a clear trend toward humanism – why else would we have strived so energetically towards signing a Universal declaration of human rights? And the Millennium Development Goals, the Sustainable Development Goals all state the welfare of humans as the ultimate good. Is that the difference between Europe and the U.S.? Is Europe today still shaped by “tribes” such as religions and nations that are divided amongst borders that were drawn up to centuries ago, whilst in America these don’t exist so explicitly? Yes, it is one of the differences. Partially, that’s why I believe there is so much less radical Islamization in the United States – it’s easier to become an American than it is to become a Spaniard, a Frenchman or a German. Another contributor to the decline of international violence has been a changing set of norms in institutions. The UN and NATO, the African Union and EU emit soft power, they communicate a certain level of expectation. These norms are toothless – whether that’s good or bad is a different question – but they serve as a restraining force. These norms include that you don’t change borders by force anymore, you don’t conquer other countries, etc. This, of course, isn’t always followed, as we saw with the annexation of Crimea; but by and large this has been a great contributor to a more peaceful coexistence amongst nations. …yes – there is the fiction of Putin satisfying the will of the Crimean people. The rest of the industrialized world teamed up to condemn Russia’s actions and impose sanctions shows you that the norm is still in existence, even though it may not be observed always. But we need to remember that when we talk about the decline of international violence, the extent is threefold. We have wars, but there is also ordinary crime and institutional violence. If you don’t live in a war zone, it is far more likely that you are killed by homicide than through any other way, so all discussion about violence must keep ordinary crime in mind. Here, there has also been a crass decline – the rate of crimes committed has dropped significantly ever since the middle ages, saw a spark again around the 1960s, but since 1990 has been dropping and dropping. The third area is institutionalized violence – corporal punishment, capital punishment, the criminalization of homosexuality, just to name a few examples. In the West, this has declined significantly. …ironically, Kant’s writing was very utilitarian. He said that if trade exists between two countries, it is less likely that they attack each other. His embrace on republicanism – or arguably democracy nowadays – was also utilitarian. There is a difference, though, between the historical and the actual question. I look into why the rate of violence has dropped, and the moral question – what are we ought to tell and teach people? Certainly, I agree with the principles, but it may be a bit unrealistic to think that every person on this earth abides to a value such as that every life is equally sacrosanct. Looking back to explain to what we attribute our development, part of it is the utilitarian calculation – if there is incentive, regardless of morale, to stop fighting, then so be it. …if it was the wrong summum bonum. Wars were, and still are, fought for religious purposes, for national glory, or the triumph of a communist utopia, for example in China, the USSR or Cambodia. A shift in the summum bonum towards loose humanism, where life is better than death, education better than ignorance, health better than sickness, is what I believe we are seeing currently. It almost sounds too good and easy when you hear it – who would be opposed to any of this? Notions such as the existence as salvation in the afterlife is very different from human flourishing, or the glory of the nation. That is interesting! Though if not religion, is there anything that can replace that motivation in our digital age? We have made fantastic progress in human flourishing despite setbacks in Russia and Turkey. Despite all the progress that has been made, in education, health, diplomacy, I think there is still a failure of politicians, journalists, the “intelligenzia", to show that there is more to strive for still. We will never reach a utopia, but the bettering of the human condition could still happen quicker. Do you think this process is reversible, though? Are we experiencing a golden age and have dark years ahead, or is it that these standards and values are here for good and will stay? The honest answer is: I don’t know. Threats such as Boko Haram and ISIS can, and they are, exaggerated. The human toll of Civil war has increased over the past year, but it is merely taking us back to the casualty count of the year 2000. The progress we made in the 1970’s, ‘80s and ‘90s has not been wiped out, and although there have been threats to democracy, democratization has not been wiped out as such. The civil wars we see are central to an area that spans from Western sub-saharan Africa to Pakistan. Of course the standards we have set are reversible – diseases can come back, religion can and has already led back to war. What we need to do is figure out how to best deal with them, and have confidence that given the progress we have made, further progress is possible. But how does that help individuals? If you are in Syria right now, it is no good that the overall number of civil wars has gone down. And how does one single act – for example 9/11 – unravel and maybe even topple this model? Firstly, the experience of violence to an individual is irrelevant to policymaking. If we were to go down that path, we could deny global warming just because it is cold out today. But what effect does this have on third party observers? It has been proven that we are asymmetrically influenced by singular events. This has been exploited by terrorists for example – terrorism being the cause of death is very unlikely in anyone’s life. However, due to the publicity that terrorist attacks generate, it seems like a completely rational fear to be afraid of a terrorist attack when in reality it should not be. It is a mistake to allow terrorism to dominate foreign policy on a global agenda. In terms of everyday terrorism, the harm is the reaction. Keep in mind that 97% of all terrorist agendas end in failure, so it isn’t even a successful mode of achievement. In Europe, we have a different setup and proportion of religious diversity than in here in the U.S. – how do you look at arising conflicts, and in particular any violence that may arise because of the increasing muslim population? We have seen that if centrist parties pretend like there is no problem – as the coalition government in Germany has done to some extent – they are implicitly creating a space that gives right-wing parties the opportunity to increase their votes. There are risks of lack of assimilation, misogyny, potentially a higher risk of terrorism. If centrist parties don’t openly state that, someone else will and thus will pull over voters. The hegemony of politically correct views in major political forums has come back to bite us all. If people think that the only way to say the truth is to be Donald Trump or Marie LePen, that is a dangerous temptation. One of the arguments of the rights in Europe is that Islam is not peaceful and not compatible with the Western way of life. At the same time, you mentioned that the majority of conflicts still happen between West Africa and Pakistan, an area that has almost exclusively muslim countries. Diachronically, and historically, could you claim that in muslim countries there is more war going on than there is in the christian world? Currently, it is estimated that 10 out of the 11 wars have radical islamist forces on one side. It is not as much that the rate of war in the Islamic world has gone up, but the rate of war in every corner of the world has gone down apart from in the Islamic world. Historically, there has been an awful conquest of Christian nations – the British, Spanish, French, Germans, and so on, so making an argument of that is difficult keeping in mind the atrocities committed by, say, the crusades. Though you have countries such as Indonesia or Malaysia, one can argue that many of the beneficial trends over the past century have not yet penetrated the islamic world. We need to keep in mind that generalization, especially in the context of Islam, is very dangerous – look at countries such as Malaysia or Indonesia. They are democracies to some extent, are peaceful and do not have any kinds of problems that Syria or Mali are dealing with currently. Furthermore, we need to distinguish between dogma and identity claims – the combination of which can intensify any conflict because it makes any rectitude and morality unwilling to compromise. Also, the jihad sees death merely as a transition into an even better life, so during conflicts, fighters act in a completely different way than in any other conflict. I agree that wars aren’t purely religious, but religious views within a conflict don’t help contain a conflict, and never have. Mr Pinker, thank you for your time. Steven Pinker is the Johnstone Family Professor in the Department of Psychology at Harvard, where he has taught since 2003. The cognitive and experimental psychologist is the author of several books, including “The Language Instinct” (1994), “How the Mind Works” (1997), “The Stuff of Thought” (2007) and “Better Angles of Our Nature” (2011). Pinker is the recipient of numerous writing, teaching and research awards, among them the Early Career Award from the American Psychological Association and the Henry Dale Prize from the Royal Institution of Great Britain.